Magic Island is located inside Ala Moana Beach Park just a mile away from Waikiki. One of our favorite wedding locations in Honolulu, great for sunsets or midday blue-sky weddings too. Ala Moana Beach Park is not crowded in the early afternoon. 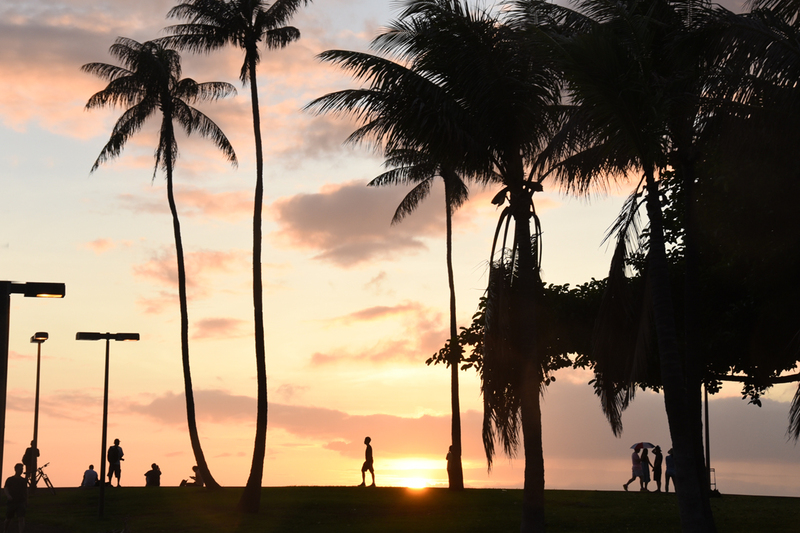 Local residents enjoy an evening walk and sunset view at Magic Island before dinner. Bridal Dream Hawaii specializes in beach weddings at several beautiful Wedding locations in Honolulu and elsewhere around the island of Oahu. These photos were taken at the scenic MAGIC ISLAND at Ala Moana Beach Park. This is a great wedding location for classic views of the famous "Diamond Head" volcano and great sunset photos too. We're happy to have Jose & Arlene's lovely wedding photos in our Photo Gallery collection. CONTACT US today to put together a Wedding package for you at this location, or visit our WEDDING RESERVATIONS to reserve your Magic Island Wedding.